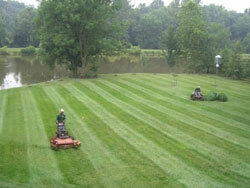 D & S Lawn Management provides quality lawn and property services to meet your needs. Our services include lawn mowing, fertilization and weed control, leaf collection and removal, hydro-seeding, snow and ice removal, mulch delivery, debris hauling. Lawn Mowing - We provide quality lawn mowing services for your residence or business. Our mowing equipment is maintained daily to ensure your lawn will looks its best during the growing season. Fertilization and weed control - We know how to make your lawn look beautiful with proper fertilization and weed control methods. We can help you have a health y and attractive lawn. Leaf collection and removal - We offer leaf collection services to area municipalities during the Autumn season. Our goal is to provide efficient leaf collection to residents through regular, zoned collection from October through early December. Snow and ice removal - Let us take care of your snow and ice removal needs with our well maintained trucks and plows. Our professional and reliable snow removal team will work hard to remove snow and ice from your residence or business. Holiday Lighting - We provide full service, start to finish. Exterior holiday decorating for commercial and residential properties. This includes having our team perform installation, maintenance, and removal of the holiday lights and decorations. We can also provide storage for your purchased holiday lights and decorations in our 7000 sq foot warehouse! For an estimate please visit our request a quote page. One of our sales members will contact you within 24 hours to assist with your decorating needs. Mulch delivery and debris hauling - We have the equipment to deliver mulch and other products or haul construction materials and other debris. Let us save you time and money on your next project.